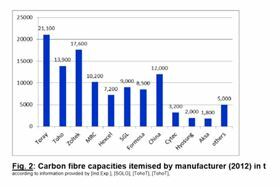 Carbon fibre capacity by manufacturer in 2012. (Source: The Global Carbon Fibre Market 2013, Carbon Composites eV [CCeV]). Toray, a manufacturer of regular tow carbon fibre (carbon fibre with 24,000 filaments or less used for high-end applications such as aircraft) plans to make Zoltek a wholly-owned subsidiary in order to enter into the large tow carbon fibre (carbon fibre with 40,000 or more filaments used in applications such as wind turbine blades) business. This transaction represents a great result for our shareholders, customers and employees. 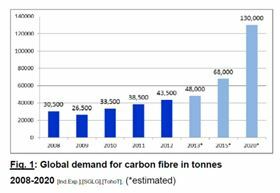 Toray provides unique opportunities to drive the continued growth of our commercial carbon fibres business well into the future. In connection with the execution of the agreement, Zsolt Rumy, Zoltek’s chairman and CEO, entered into a voting agreement with Toray, in which Rumy agreed to vote his company stock, representing approximately 18% of the company’s outstanding shares, in favour of the merger. The transaction is expected to close late 2013 or early 2014. Since late 2012, Zoltek's board of directors has been under pressure from a group of shareholders called Quinpario Partners LLC to improve the company's financial performance. In April this year, Zoltek announced that it is starting a process to "explore and evaluate strategic alternatives to maximise shareholder value," and engaged J.P. Morgan Securities LLC as its financial advisor for this process (see Zoltek hires financial advisor for strategic review). Zoltek began as an industrial equipment and services company. It entered the carbon fibre business through an acquisition in 1988. Zoltek also says it proprietary carbon fibre lines enable it to expand capacity at a fraction of the cost and time required by its competitors, thus enabling it to support large-volume applications. In 2012 Zoltek supplied almost 10 million lbs (4000 tonnes) to Vestas, the largest buyer of carbon fibres, on a 100% supply basis. Wind energy has become an important market for the company. In its Fiscal Year 2012 Shareholders Meeting presentation (1 February 2013), Zoltek reports that it supplied almost 10 million lbs (4000 tonnes) of carbon fibre to wind turbine manufacturer Vestas in 2012. The company also says it has a number of customers developing large blades for offshore projects and it has blades from 56 m to 85 m in testing and development. Zoltek is also working with several automotive companies and their Tier 1 and 2 suppliers. It has an agreement with Magna for the development and commercialisation of carbon fiber SMC products (see Magna and Zoltek launch carbon fibre SMC), and is quoting on specific proposals for a variety of programmes. The company is also developing thermoplastic products in-house and with partners in Europe and the USA (see Zoltek and TCG join forces to develop carbon fibre thermoplastics). Headquartered in St Louis, Missouri, Zoltek also has manufacturing locations in the USA, Hungary and Mexico. For its financial year 2012 Zoltek reported net sales of $186.3 million and operating income of $25.6 million. Chemicals group Toray has the world's largest production capacity for carbon fibre and a strong position in aerospace applications. Of Toray's recorded net sales of 1592 billion Yen in 2012, 77.6 billion Yen came from its Carbon Fiber Composite Materials business which has production bases in Japan, the US, and Europe and plans to start up a new plant in South Korea in 2014. Expansion of it carbon fibre composites business is part of Toray's strategy (see Toray to increase global carbon fibre capacity). Entering into the large tow carbon fibre business will further expand this business. Toray believes the global demand for PAN-based carbon fibre will expand at an annual growth rate of more than 15%. This growth is in the area of regular tow carbon fibre, which is widely being accepted in high performance applications such as aerospace, and in the area of large tow carbon fibre, which is anticipated to expand its applications in the wind energy and automotive markets. Toray has also identified the expansion of its carbon fibre composites business in the automotive market as one of its top priorities and has forged several partnerships and acquisitions in this area (see Daimler and Toray establish joint venture for manufacture of carbon fibre parts). Mergers, acquisitions & joint ventures review – 2013. Toray reports that it will be establishing a resin compound base in Europe for the first time. y Avio SpA and Toray Industries have signed a long-term supply agreement to supply Torayca carbon fibers to Avio for rocket motor case applications.